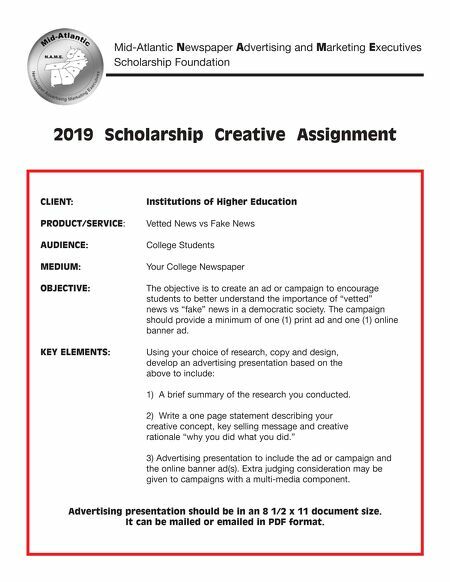 Mid-Atlantic Newspaper Advertising and Marketing Executives Scholarship Foundation 2019 Scholarship Creative Assignment CLIENT: Institutions of Higher Education PRODUCT/SERVICE: Vetted News vs Fake News Non-Verified Posts and Blogs o AUDIENCE: College Students MEDIUM: Your College Newspaper OBJECTIVE: The objective is to create an ad or campaign to encourage students to better understand the importance of "vetted" news vs "fake" news in a democratic society. The campaign should provide a minimum of one (1) print ad and one (1) online banner ad. KEY ELEMENTS: Using your choice of research, copy and design, develop an advertising presentation based on the above to include: 1) A brief summary of the research you conducted. 2) Write a one page statement describing your creative concept, key selling message and creative rationale "why you did what you did." 3) Advertising presentation to include the ad or campaign and the online banner ad(s). Extra judging consideration may be given to campaigns with a multi-media component. Advertising presentation should be in an 8 1/2 x 11 document size. It can be mailed or emailed in PDF format.